As part of our NewViews Feature Showcase on EFT (electronic funds transfer), we wanted to provide answers to some of the most frequently asked questions on NewViews and EFT. What is the best way to record a payment transaction made by EFT? Can NewViews do it for me? Answer: When you use the Tools > Pay Account command to pay vendors, it will automatically check to see if any vendors have their EFT Status set to active. Note that when you set a vendor’s status to active, you have to include the following EFT payment information: Bank ID (Canada only), Bank Transit, Bank Account and Transaction Code (USA only). For vendors with active EFT Status, The Tools > Pay Account command adds the payment transactions to an EFT payments journal. Once these payment transactions have been added to the journal, they are used to generate an EFT file that is uploaded to your bank. To watch a short video that explains all these steps in detail, click here. 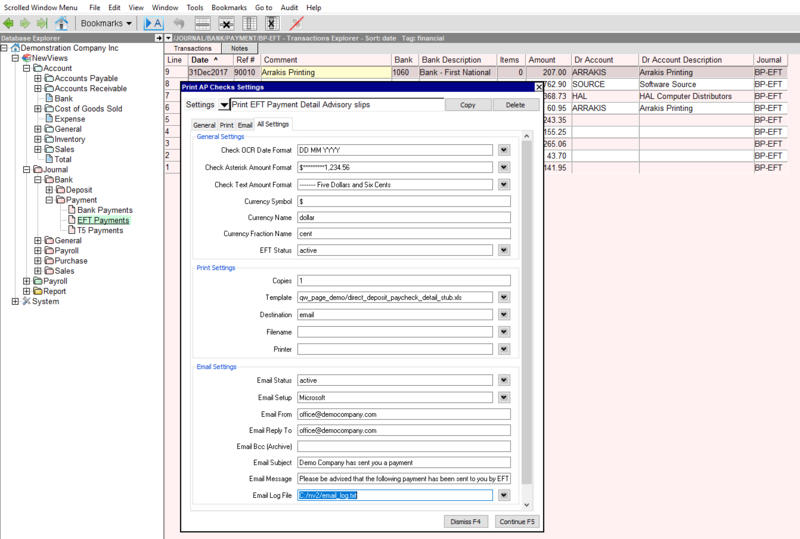 After I have recorded the EFT transaction in NewViews, how can I alert vendors that I have sent them payment through EFT? Answer: After issuing a payment you can print or send an EFT payment notification by email directly from NewViews. To do this all you need to do is select the items you want to send an advisory for, and issue the command Print > AP Checks. From here, you can select an EFT payment advisory template, and set the Destination to email. You can also save these settings so that you can easily switch between printing checks, and emailing or printing EFT payment advisories. I’ve created the EFT file – how can I find it so I can upload it to my bank? 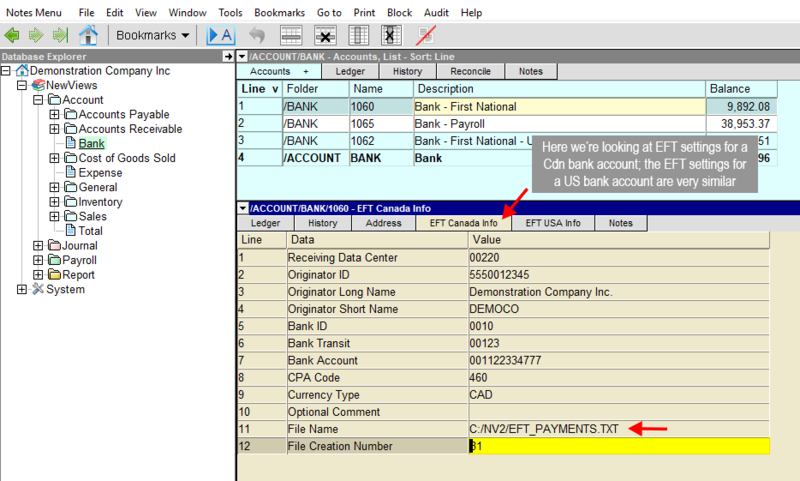 Answer: The name and location (path) of the EFT file created by NewViews for uploading to your bank is entered in the EFT Canada Info or EFT USA Info settings of the bank account. We strongly recommend that you overwrite this file each time you create an EFT file to ensure that you don’t upload the same file more than once. Answer: There is NO additional cost! EFT functionality is built into NewViews, so the only additional charges are any your bank may impose.